The MAN A24 (NG363F) is a fully-low-floor, rear-engined articulated transit bus built by MAN Truck & Bus, with various units operating around the world. 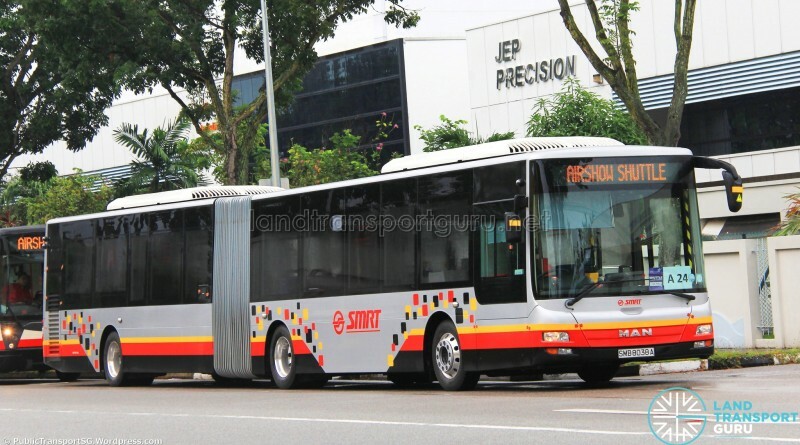 SMRT Buses was the sole local public transport operator with the MAN NG363F, with a single demonstrator unit brought in for evaluation, and 39 additional units purchased as part of the first production batch. The MAN A24 (NG363F) is part of the NG3X3 line of articulated bus chassis, assigned the model designation of A24. It was designed off MAN’s popular urban bus line, the Lion’s City, which was only available with integral bodywork by MAN. The NG363F is available with various bodywork designs from different manufacturers. MAN NG363Fs come with the standard MAN D2066 LUH inline 6-cylinder, horizontally-mounted, turbocharged & intercooled engine, with a range of available power outputs of between 270 and 400 horsepower over Euro III to Euro V emission standards. A less powerful MAN E2876 EEV-rated engine is also avaliable with lower horsepower output. For the Euro V rating, 320hp, 360hp and 400hp versions are avaliable, along with a 2-stage turbocharger for high torque rating. The engine uses Exhaust Gas Re-circulation (EGR) technology and MAN’s own PM-Kat® exhaust treatment system to achieve its Euro V rating. CNG engines are also available. For transmission, the MAN NG363F offers both Voith and ZF options paired with the D2066 engine. The “G” stands for Gelenkbus, or articulated bus in German. 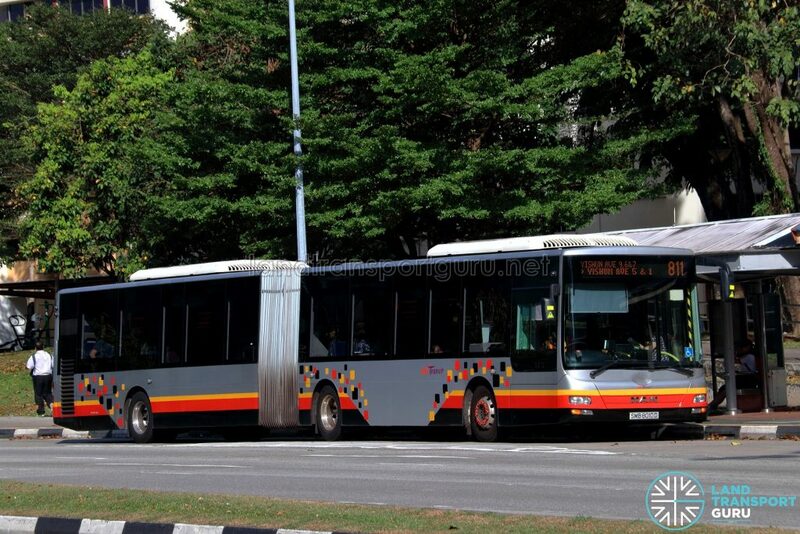 Like all other bendy buses in Singapore, the MAN NG363F is a pusher bendy, meaning that the rear wheels provide the driving force from the engine. Both the middle and rear axle deploy a drop axle (also called an inverted portal axle) design to keep the chassis height low and allow for the full-low-floor design, which aids in passenger movement. 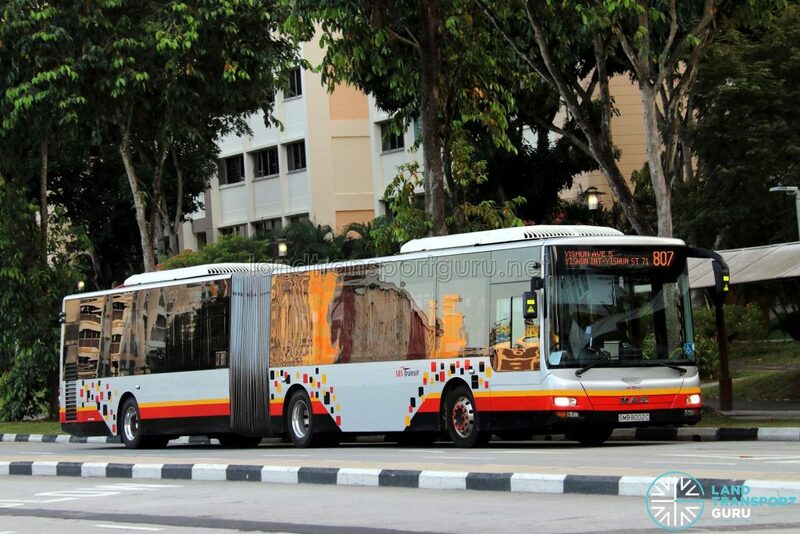 In 2013, SMRT Buses received a MAN A24 demonstrator unit for road testing and evaluation by MAN’s local dealer, ST Kinetics. 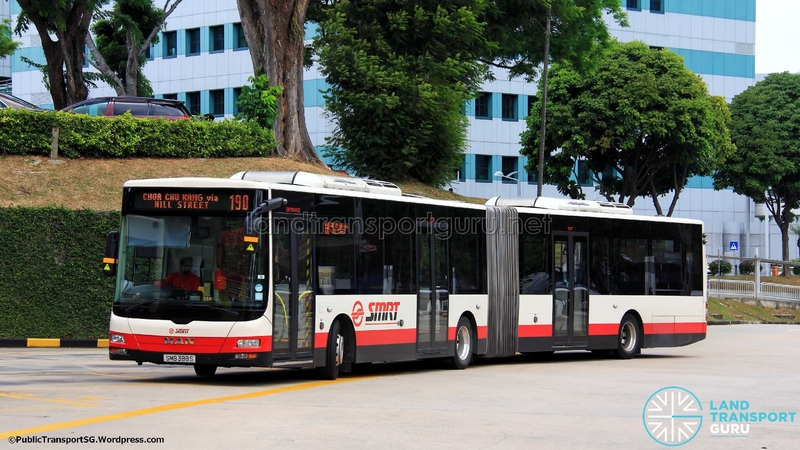 The bus was registered on 2 April 2013 as SMB388S, the sixth demonstrator bus received by SMRT Buses. Sharing many technical similarities with its rigid bus cousin, the MAN NL323F, SMRT owned at least 400 MAN NL323F buses prior to the registration of SMB388S. Exhaust Gas Recirculation (EGR) technology combined with MAN’s own PM-Kat® exhaust treatment system, hence doing away with the need for diesel exhaust fluids, and achieving the the Euro V emission standard. Chassis built in Germany, MAN’s Lion City G bodywork supplied and assembled by Gemilang Coachworks, licensed by MAN. 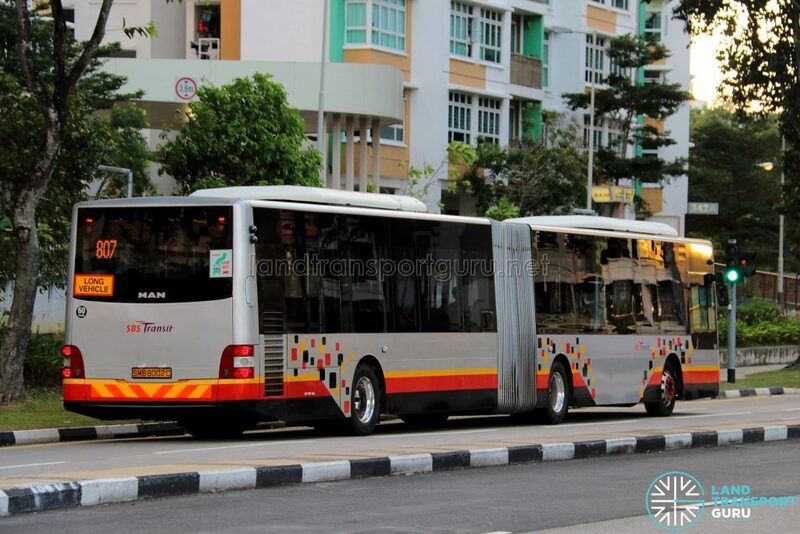 The bodywork used on this bus was similar to MAN’s integral Lion’s City G or Lion’s City GL buses, but manufactured by Gemilang Coachworks of Malaysia, under license from MAN. It was built using Alcan’s EcoRange® body structure system, which primarily uses lightweight aluminium for extrusions, sheets, and joining elements. The bus was fully assembled by Gemilang in its Johor Bahru assembly plant before final delivery to Singapore. For the exterior, many elements were standardized with the other MAN NL323Fs in SMRT’s fleet, giving it an appearance of an elongated NL323F. However, unlike the NL323Fs, the bus was not fitted with the large, curved roof attachment. On the interior, the interior fixtures and their configuration are roughly similar to the Batch 2 NL323Fs, with identical seats, grabpoles, handgrips arranged in a comparable layout. SMRT retained the unique sliding plug doors supplied by Masats (previously used for MAN NL323Fs) for the middle and rear exit doors. A single wheelchair bay is located in the middle of the bus, and a manual wheelchair ramp is installed only on the middle door. A full-low-floor design offers step-free access between all doors, across the articulation unit and up to the last row of seats. Finally, a unique, translucent articulation bellow allowed for natural light into the articulation unit during daylight hours. 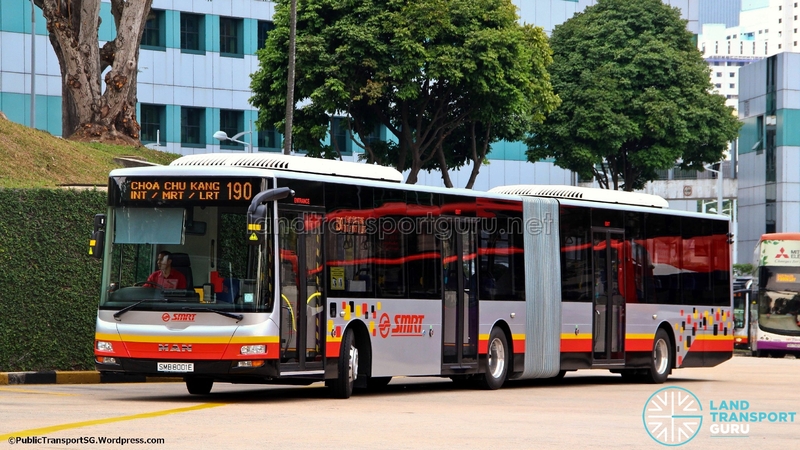 SMB388S made its revenue service debut on 18 April 2013, deployed on Bus Service 190 between Choa Chu Kang and New Bridge Road. It has since been under SMRT’s Kranji Depot and made appearances on a variety of bus routes, such as 61, 67, 106, 176, 180, 188, 300, 302 and 700/700A. SMB388S was acquired as a direct replacement for TIB838H, the very first articulated bus in Singapore, which was deregistered shortly before this bus entered revenue service. Breaking away with the tradition of registering buses in numerical order, the somewhat auspicious SMB388S registration bears resemblance to it’s predecessor. The introduction of SMB388S is reminiscent of how TIB838H came about. TIB838H, a Mercedes-Benz O405G, was acquired by TIBS as a high-capacity version of the previously-introduced and highly successful Mercedes-Benz O405. Along with similarities in the chassis, bodywork was also very similar, both built by Hispano Carrocera. For SMB388S, the MAN A24 chassis is a high-capacity version of the MAN NL323F chassis, and was also built to similar interior configurations as the previously-introduced and successful MAN NL323Fs. SMB388S scored several firsts. 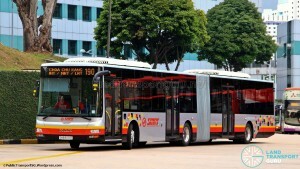 It was the first bendy bus to be brought in by SMRT Buses, and the first fully-low-floor and wheelchair-accessible bendy bus in Singapore. It is the second transit bus in Singapore to use Gorba-manufactured EDS (after SMB136C and not including PA9588S), and the first transit bus in Singapore to have air-conditioning units supplied by Spheros. SMB388S has a licensed capacity for 130 passengers: 54 seating and 76 standing passengers. Originally fitted with Spheros air-conditioning units, they were replaced by Denso LD8i units in 2016, similarly used on the Production Batch buses. 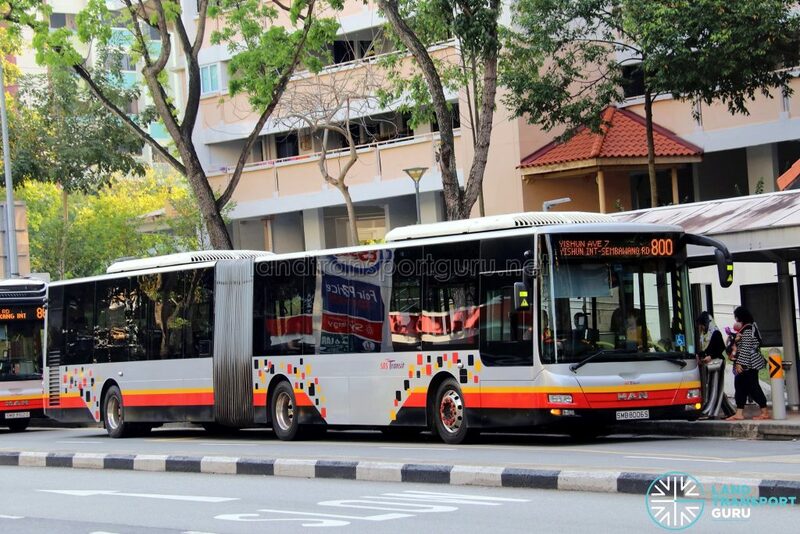 In April 2014, SMRT announced the purchase of 40 MAN A24 articulated buses (which included the demonstrator unit SMB388S). They were acquired as a direct replacement for the initial 40 Mercedes-Benz O405G (Hispano Mark I) buses registered in 1997, namely TIB849B – TIB883B. A total of thirty-nine (39) Production Batch units were delivered, registered as SMB8001E – SMB8039Y from 11 Mar 2015 – 16 Nov 2015. Technical specifications are similar to the demonstrator unit SMB388S; however the unladen weight of a production batch bus was reduced to 16320kg, 160kg lighter than that of SMB388S. All units were delivered with SMRT’s pixel livery. The first production batch unit, SMB8001E was spotted in SMRT’s new pixel livery in Woodlands Depot in early February 2015. The bus was registered on 11 March 2015, and commenced revenue service on 15 March 2015, appearing on Bus Service 190. Similar to the demonstrator unit SMB388S, the bodywork used on Production Batch buses were built and assembled by Gemilang Coachworks of Malaysia using Alcan’s EcoRange® aluminium-based body structure system. The exterior was also similar to that of SMB388S, but painted in SMRT’s silver-based new livery. Roof-mounted air-conditioning units were supplied by Denso rather than Spheros. EDS units were supplied by Mobitec to standardize with many other SMRT buses. On the interior, the fixtures and layout are almost similar to SMB388S. The translucent articulation bellow was replaced with opaque ones. To increase standing space, three seats have been removed: two rows of forward facing seats between the entrance and middle door are now three-abreast, and the last seat was removed from the rear section of the bus. Fixed air-conditioning vents were replaced with adjustable louvres. Production Batch MAN A24s have a licensed capacity for 131 passengers: 51 seating and 80 standing passengers. They are deployed mostly on feeder and intratown bus services. Under the Bus Contracting Model, the Land Transport Authority owns and leases buses to the individual public transport operators under term contracts. SBS Transit, who was awarded the Seletar Bus Package contract in April 2017, began operating MAN A24 buses intended for Yishun feeder bus routes. Clarifying the Differences: D2066 LUH-32 or LUH-33? Both the LUH-32 and -33 engines are very similar; they are almost the same engine with minor differences in their engine control unit (ECU) which subsequently affect engine output. SMB388S exhibits many characteristics of weak output, but its engine need not have been tuned identically as a default -32, it could have just as well been a detuned -33. Not to mention that SMRT (and SBS Transit) frequently detune their buses to levels better suited for regular local operations (which saves on fuel and maintenance regimes). Since LUH-33 has been the standard production engine for all NG363F chassis produced by MAN for years, there would be no reason to assume that SMB388S would be fitted otherwise. What I understand is the A24 are not BSEP buses; hence is still owned by SMRT, but LTA leases them from SMRT for the BCM. So this is the first time the tendered bus packages are not using BSEP and govt-purchased SG-plated buses. MAN A24 should also be in GCM as well. 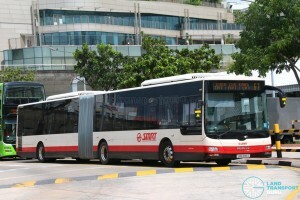 SMRT used to park some bendy buses at Bulim Bus Depot. Should hand some over to Tower Transit / future operator of Seletar bus depot other than SMRT/SBS. Bendy buses should be good for routes serving wide roads and high demand. If part of the roads are narrow, rigid buses are still ideal. I totally agree that LTA could use some MAN A24s for BCM , but these bendies take almost double the space of DDs or SDs on normal roads. All bus service are to take the DDs as a high-capacity bus in the future and the Bendies will have to find somewhere else to call home. But these information are not confirmed , I hope these bendies continue service as its iconic to Singapore.